After long awaited, Acer has finally announced its new Android based smartphone which is known as beTouch E140. 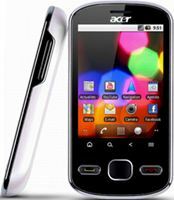 The new Acer Android smartphone has been designed with small and compact size for pocketability, usability and ergonomics. The compact smartphone is targeted to those who look for a small device with integrated all cutting-edge technologies available on the mobile market. The smartphone is runs on Android 2.2 Froyo operating system and powered by 600Mhz processor. Featured with a 2.8-inch QVGA display, the beTouch E140 is also equipped with a 3.2-megapixel camera for capturing spur-of-the-moment snapshots. It boasts with A-GPS, supports HSDPA and Wi-Fi, integrated with FM radio for users to enjoy their favorite songs while on the go and comes with a 1300 mAh battery. Additionally, it is Bluetooth enabled and supports up to 32GB of MicroSD memory card. The Acer beTouch E140 is expected to be available in UK and the actual price is not yet announced.